A personal commonplace book in the digital age. "Buy local." We hear it all the time. We read it everywhere. Local officials pound it into our heads as if the very fabric of our society will be at risk if we don't spend money as "locally" as possible. Alas, local doesn't always mean close to home. 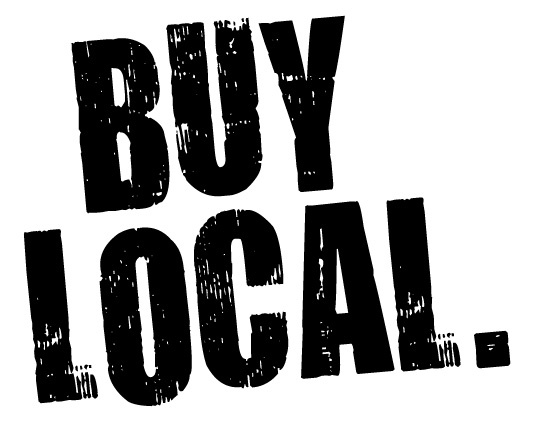 "Buy local" means, to many people, driving past the neighborhood pharmacy to one further away, but owned by someone who lives locally. The pharmacist at the neighborhood store may or may not live locally, but his store is owned by a large corporation, so we shouldn't support him. In another instance, I know several people who refer to one car dealer as local because the general manager is perceived to be more locally-minded than other car dealerships' managers. None of new car dealerships in town have owners who live in the city, or even the county, though. In fact, the dealership perceived as being the most "local", is owned by a large company a hundred miles away, probably the least local in actuality. If all that's not confusing enough, local connotates the ownership structure of the business to many people, and even its proximity to the center of town. For instance, a family who owns a franchise business in a busy retail area, and has bought and paid for its building and fixtures, is often seen as being less local than a small "independent" shop in the downtown area that rents its space cheaply and has made little capital investment in the community. In one such example, I've often heard people say that they don't like to frequent the Mexican restaurant in a retail shopping area on the edge of town, because it's a "chain" and not local. The reality is, it's one of 4 similar restaurants owned by a family, and the first for the son striking out on his own, with his parents' successful restaurants as a model. Nonetheless, business suffers in part because locals prefer to frequent the Mexican restaurant downtown, also family owned, but in cheaper space there, instead of having taken the gamble and initiative to build a new, modern restaurant. Another way "local" can often be misconstrued is jobs. Like it or not, the multinational behemoth Wal-Mart actually employs LOTS of local people. The giant retailer is also a huge payer of sales taxes as well, certainly pumping more dollars into the local governments than the sum of the small businesses it displaces. Similarly, the huge values placed on the land and buildings of a national retailer make those businesses a boon to local causes supported by real estate taxes. The tens of millions of dollards spent by national retailers in capital improvements to a property simply couldn't be matched by "local" businesses in many cases. The reality is, local schools, health agencies, and other concerns all benefit, and couldn't function at the capacities they do, were it not for companies like Wal-Mart, who pay hundreds of thousands of dollars in real estate taxes annually in each small town they operate in. So the next time someone suggests that you "buy local," I'd encourage you dig beyond your first impressions, and consider that all kinds of retail spending in a community are important to the success of that community. My apologies for what seems a long-winded rant, and my thanks if you read this far. To be fair, I am a customer at most all of the businesses alluded to above, and appreciate each of their commitments to and investments in our community. What a blessing to live in a land & time when we have so many choices about how we spend our money! I was born and raised in Marysville, Ohio, and have made a conscious decision to make it my home. My wife, Pam, and I have a daughter and a son, and are attempting to raise them in a Christian home. I'm employed at Connolly Construction Co. and am very passionate about my work: making Marysville a better place to call home. This blog is entirely personal, and doesn't represent anyone's views but my own. Disqus: a Tech Giant in the Making? Family + Building Projects + Photography= FUN! Orthodox Christianity for a Modern Man?